In the midst of all the horrific headlines and news that Jews worldwide, anxiously scanned as the Mumbai tragedy unfolded, a name kept appearing: ZAKA. As the world prayed and waited with bated breath to learn the fate of the Chabad House hostages, select help from Israel was on the way. The Jerusalem Post of Thursday November 27 read: MDA and ZAKA Dispatch Teams to Mumbai. "After consultation with the Foreign Ministry's situation room this morning, it became apparent that ZAKA must immediately send a delegation from its international response team to deal with the unfolding situation in Mumbai. The team is carrying all the advanced medical equipment necessary to deal with any eventuality, including the need for medical air transport," said ZAKA chairman and founder Yehuda Meshi-Zahav. While MDA – Magen David Adom, Israel's version of the Red Cross – is well known, ZAKA may be less familiar. Who are they? What were they doing on the front lines of this critical mission? Israelis know this organization all too well, and in a country of divided opinions about almost everything, unequivocally feel the greatest respect and gratitude for its dedication to a most painful and difficult task. Formed in 1995, ZAKA is an acronym for the Hebrew words for "Identification of Victims of Disaster." They became well known during the last intifada. At and after a terror attack, they could always be seen, wearing neon yellow vests, at Tel Aviv's Dolphinarium, at Jerusalem Sbarro, at Netanya's Park Hotel, and other infamous sites, painstakingly searching through the devastation and gathering shreds of human remains. 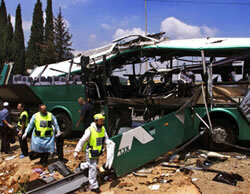 Terrorism has proven the mettle of the ZAKA emergency medical organization. They also respond to the scenes of automobile accidents and all other sorts of first-responder situations. The Torah places great importance on treating the deceased with utmost dignity, the body being G‑d's creation and the soul's dwelling. Taking care of the dead is known in Hebrew as "chesed shel emet," the true kindness, the ultimate in altruism—as the beneficiary cannot repay the kindness. Preparing the dead for burial, a task usually performed by the Chevra Kadisha burial society, is no easy task, even under normal circumstances—and certainly not under the extreme and horrific conditions of brutal terrorist attacks or gruesome accident. Last to leave, ZAKA crews are often also the first to arrive in the critical moments right after an attack. Trained paramedics, they are connected by a network of beepers, walkie-talkies and cell phones. 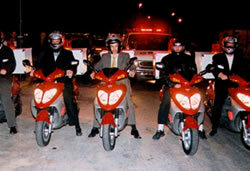 Motor scooters enable them to cut through traffic and rush to the scene. 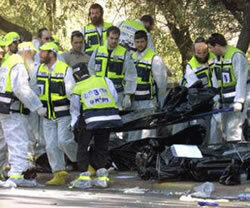 In the chaos, they administer first-aid and guide Magen David Adom ambulance crews to the most critical victims. It is a bone-chilling experience. Many ZAKA volunteers have had the unenviable task of cradling in their arms a dying child or a severely maimed victim crying for help. As ambulance sirens fade into the distance, they begin the grisly task of gathering limbs that can be rushed to the hospitals and reattached; and body parts, blood, hair and whatever remains of the victims for proper burial. One would think that ZAKA's volunteers have their fill of their selfless and dangerous work at home, and would be content to let larger and wealthier countries worry about the rest of humanity. But no. 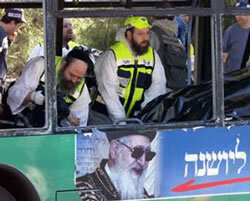 Their caring, capable presence can be found wherever tragedy strikes, provided the country allows Jews to enter. ZAKA members assisted in the recovery after the bombing in Kenya, and helped the search and identify mission for space mission Columbia's crew's remains in 2003. Upon arriving in Houston shortly after the Columbia disaster, ZAKA's Yisrael Stefansky said, "We unfortunately have much experience in this area from the terrorist attacks. Searching for body parts, we can identify what others cannot." In late 2004 and early 2005, members of ZAKA provided assistance in Thailand, Sri Lanka, India and Indonesia in the aftermath of the tsunami. Forensic teams reportedly dubbed the group "the team that sleeps with the dead," because they toiled nearly 24 hours a day at Buddhist pagodas in Thailand that had been transformed into morgues to identify those who died in the tsunami. The experience of ZAKA members, who reportedly see 38 bodies a week on average in Israel, helped the Israeli forensic team to identify corpses faster than many of the 20 or so other forensic teams that operated in Thailand in the aftermath of the disaster, which placed them in high demand with grieving families. ZAKA volunteers are not macabre thrill-seekers. They are ordinary people who join to help others. Almost all of ZAKA's 1000 plus volunteers are employed at normal day jobs throughout all strata of Israeli society. "All volunteers are family-oriented people and have jobs and a stable life, which is critical to this job," says Talia Zaks, Deputy Director of ZAKA's General Projects and International Affairs. "ZAKA is open to anyone from all sectors, religious, secular, men and women." A ZAKA volunteer must undergo rigorous training that tests one's physical, as well as emotional fortitude. ZAKA is part of Israel's security system, and volunteers are trained by the police and Magen David Adom in proper management of forensic evidence and religious management of the deceased. "According to Jewish tradition, it is disrespectful to leave behind any body part, including blood," says ZAKA member Isail Hassa. "All body parts must be buried, preferably within 24 hours of death." Yaakov Ury is typical. The grandfatherly Jerusalem native owns a pizza parlor. Three years ago, he personally experienced a bombing at Jerusalem's Machaneh Yehuda outdoor market. "I stood there traumatized, not knowing what to do. So I decided to join ZAKA." Recently fund-raising in America, Ury showed a scrapbook of ZAKA's work. One photo shows volunteers leaning over a balcony to scrape remains from a wall. "Human remains splatter onto trees, roofs, and balconies," says Ury. "We use long ladders to gather the pieces, and then match them like a puzzle. We have experience, and we also use DNA tests." ZAKA volunteers endure more than gruesome aftermaths. They literally risk their lives by coming on the scene. They may have to dodge snipers' bullets. Secondary "human bombs" may lurk in the shadows after an initial attack, waiting to explode themselves in the midst of the volunteers, police, soldiers, rescue workers and innocent bystanders. "Believe me," Ury says, "it's so hard for the volunteers. But something pushes them to do this. Each volunteer feels he has to do it, and goes back again and again." The possibility of saving lives helps ZAKA volunteers keep on going, despite the horrific carnage and danger. "I've saved babies who've stopped breathing," says Bentzion Oiring. "Saving a person's life gives you satisfaction for weeks. It keeps you going when we must clean the scene of the next terrorist attack." ZAKA receives no government funding, and relies on private donors, in Israel and abroad, for its equipment, ambulances, yellow vests, the plastic containers to collect blood and body tissue, the cell phones and the body bags. "Saving those who can be saved, honoring those who cannot," reads their website. As of this writing, the ZAKA team is waiting to clear the government and bureaucratic obstacles to return to Israel with the precious cargo of the martyred Chabad House victims. Honoring and securing their remains was tragically all that could be accomplished. While completely dedicated to his mission, Yaakov Ury looks forward to spending more time serving pizza to his customers. "Everyone wants their organization to grow and develop," he says of ZAKA, "but we pray that ours will go out of business." For more on ZAKA, visit their official website. There is family Hadad from Kvar Chabad, who many members of this family do this.